Melton Mowbray claimed the derby spoils as they edged out Syston Town Second XI in a high-scoring Division Three clash at the All England. The home attack struggled for wickets in good batting conditions as Chris Pole and Charles Wootton both hit 84, while George Corbett chipped in with 31 in Syston’s challenging total of 262-4. Wicketkeeper Simon Claricoates made a well-paced 44 off 41 balls, while fellow opener Pete Humphreys (64) helped lay a solid foundation to the reply. Number three Joe Peveritt kept Melton up with the rate, hitting eight fours and a six in a knock of 68 off 56 balls. Middle order wickets for Jaimal Bathia (3 for 72) upped the pressure on the home side, but Paul Stevenson hit 22 off just 12 balls, and Gary Potter’s unbeaten 30 saw Melton to their target with six balls and four wickets to spare. Barkby United Second XI’s hopes of promotion to Division Two took a severe dent as they were well beaten at bottom side Ratby. After the hosts posted 236-6, Lewis Copson took 8 for 38 as Barkby were skittled for 70 inside 19 overs, with Jack Johnson (30 not out) the only batsman into double figures. 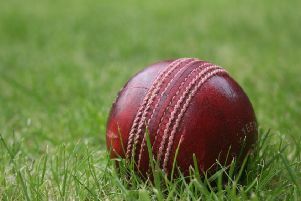 Queniborough strengthened their promotion hopes as they went 72 points clear in second place in Division Four East following a three-wicket win at Great Glen. And Thorpe Arnold Seconds also look destined for promotion after returning to winning ways at Illston Abbey. Kane Williams (3 for 43) and George Exton (3 for 46) helped restrict the home side to 240-9 before Thorpe opener Mark Carnell (60) hit anther half-century to give the chase momentum. Skipper Jordan Hirst made 44, before Andy Sibun struck a rapid unbeaten 87 to see the visitors to their target, five down, in just 33 overs. The win keeps them top of Division Six East, 32 points clear of Bharat Sports and 75 ahead of third-placed Shree Sanatan.